Throughout the whole game, the player encounters creatures from the other side, called the Entities. We designed the Entities sounds as a team. For the part of the job that was assigned to me, Kyma helped me a lot to find and propose layers for the movements and the growls of the creatures. I recorded some collections from the Tau Player, then put the results into the 3DMorphSampleCloud to merge with some human voices. I also got some very exciting results from the 100 Whooshes patch from JED (sound designer, Jean-Edouard Miclot). In this sound, the player is inside a kind of supernatural tempest. So I needed very consistent sound for the ambience. I used the 3DMorphSampleCloud prototype to merge and modulate various sound effects (wind, sand movements, volcano, dogs growl, my voice). This is the sound made by some weird monsters made from sand particles; they come up from out of the ground to attack Jodie (the main character). I used the CrossFilter prototype to cross human voices and moans with the sounds of wind and gas jets. I’m new Kyma user (1 year), and I’m so excited about getting deeper and deeper into Kyma. There’s something unusual and magic when I switch on my Pacarana. I know I’m going to spend time dedicated to search and experiment, and I often forget that I’m working on a computer. It helps me to focus only on the most important thing: the sound. Ilker Isikyakar, sound designer and composer at Cloud18 post production studios in New York, will be in Ankara (Turkey) on 31 October and 1 November to make a presentation on Kyma at the Audio Technologies For Music and Media international Conference (ATMM 2013). Audio Technologies for Music and Media is an international interdisciplinary conference that focuses on various aspects of audio, audiovisual and music technologies for music and media as well as the relationship between sound, music and image in both ‘traditional’ and ‘new’ media. 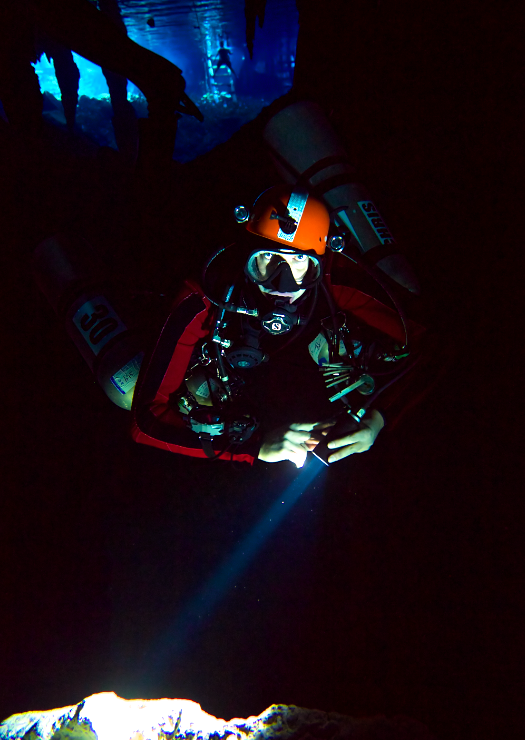 You can read Ilker Isikyakar’s abstract in the ATMM 2013 Program booklet. John Paul Jones and his triple-neck mandolin are the poster children for this year’s Festival International Mandolines de Lunel. JPJ is scheduled to perform his triple-neck mandolin live with Kyma on the final concert of the festival: Saturday November 2 at 20h45. Magic Fingers for Leap Motion and Kyma by composer/performer Wang Chi, a composer and performer whose research and composition interests include data driven instruments and sound design. Chi is also an active translator for electronic music related books, including Kyma and the SOS Disco Club. The FA Yun An man for Kyma by composer Wang Chunming, associate professor of Zhejiang University of Media and Communications, PhD candidate in digital media at the Shanghai Conservatory Of Music, and Director of the Institute of China Electronic Music. And Theatre of Spheres by composer Jeffrey Stolet of the University of Oregon. Jeffrey Stolet is a professor of music and director of the Intermedia Music Technology at the University of Oregon where he has installed 5 Kyma teaching and production studios. In addition to teaching Kyma to his composition and sound design students at the University, Professor Stolet also directs the yearly Summer Academy on the UO campus where he welcomes international students and faculty for a two-week intensive course on digital audio, sound design and Kyma. Recently Stolet completed a book on Kyma, entitled Kyma and the SumOfSines Disco Club that is currently available in English and will soon be available in Chinese. This is how Betsy Sharkey, film critic LA Times, describes Hamilton Sterling‘s sound for Morning, a film by Leland Orser with his wife Jeanne Tripplehorn, Laura Linney, Elliot Gould, Kyle Chandler, and Jason Ritter. 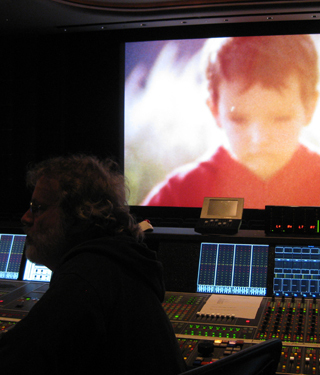 Sterling, who is credited as sound designer/re-recording mixer/supervising sound editor on the film, used Kyma to process the transitions to the characters’ memory flashbacks of their child in this tough and unsentimental exploration of a couple’s grief over the loss of their child. The film opened in LA, New York, and select cities this month and will be available through VOD and DVD for those of us who do not live in “select cities”. Choreographer Gilles Jobin’s latest creation, QUANTUM, combines movement-generators and interaction algorithms inspired by the four fundamental forces, Kyma sounds based on collision events captured by the ATLAS experiment at CERN, and a kinetic light sculpture that explores resonance and forcing functions. An outgrowth of Jobin’s residency last year at CERN, QUANTUM is an example of what can happen when artists and scientists interact with one another, exchange ideas, and learn about each other’s work. 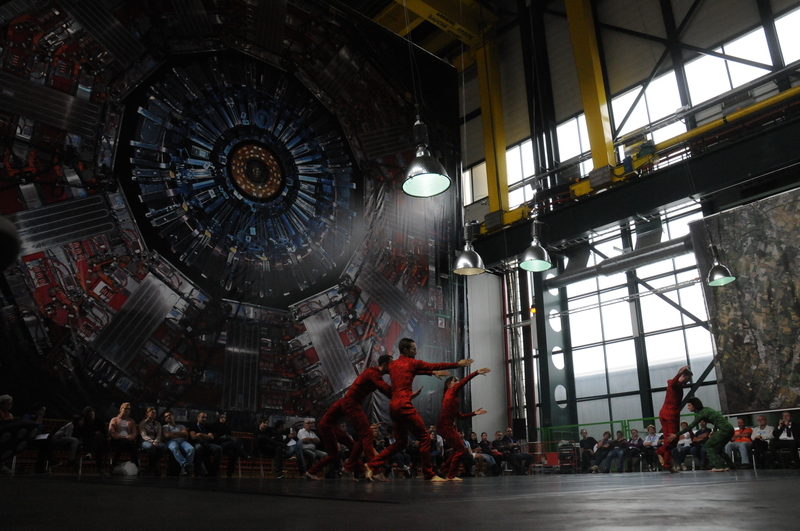 One hundred meters above the beam line of the Large Hadron Collider, against the colorful back-drop of a photograph of the CMS detector, six dancers form and dissolve fluid patterns of vibration and heat, playful non-contact interactions, flowing across the stage like a Bose-Einstein condensate, and bouncing through a bubble chamber, carried along by spinning waves of quadraphonic sound, as lights careen in wave-like patterns above their heads. And again on 14 January 2014 at Bonlieu Scène nationale – in Annecy, France. More details and credits on Gilles Jobin’s site. Sound designer Luis Aly utilized Kyma to spatialize the sound for a 13-27 September 2013 production of Brecht’s Die Geschäfte des Herrn Julius Caesar (The Business Affairs of Mr Julius Caesar) at the National Theatre of Porto in Portugal. To create the space, Aly routed eight Kyma outputs across 26 Meyer Sound speakers grouped as: Front of House (10 speakers), Surround House (10 speakers) and Back of Stage (4 speakers) and Inside Stage (2 speakers). 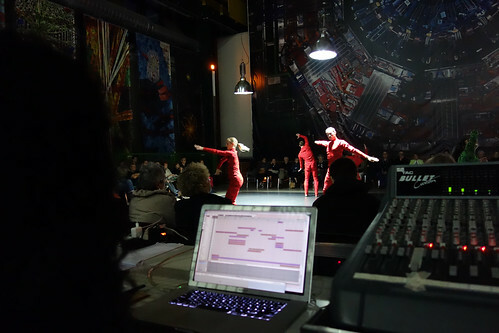 The ten actors and live musicians (voice, violin, custom electric guitar and electronics) were all miked and their inputs were mixed in a Midas Heritage 2000 mixing desk, sent to Kyma, and spread in space using reverberation and delay algorithms.